Gorgeous - Newly Updated and Furnished Throughout! Owner's just putting in last touches! Professionals photos coming soon. Golf course is currently being re-seeded ... green, green fairway coming soon! Updated from top to bottom, this gorgeous vacation home has three bedrooms, two baths plus a powder room. The spacious great room has been furnished with a comfortable sectional, large enough for family and friends to enjoy the big screen cable TV mounted over the gas fireplace. But the focal point of the great room is the view! 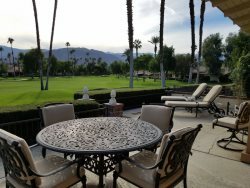 Through wall to wall windows, guest look out over the extended patio, over the West 4th fairway and beyond to the spectacular San Jacinto Mountains … often snow-capped in the winter months. The dining area seats eight, so this is a great home for entertaining. The custom kitchen has been completely updated and a modern European look, with stainless appliances, gas stove and farm sink. The kitchen bar adds additional prep space and offers additional seating for casual meals or visiting with the cook. The kitchen has been furnished with beautiful dinning and cookware, fit for the chef in your family. The stack-stone walls and wood floors in the master suite are a work of art, and add a warmth and coziness to a bedroom that guests will hate to leave … a true sanctuary! It has been furnished with a comfortable king bed, luxurious bedding and a large flat screen TV. Guests will also enjoy the walk-in closet with custom built-ins. The on-suite, in the style of the kitchen, has a very modern European look. The his and her lavatories are separated by a convenient toiletry cabinet and features an extra-large walk-in shower with hand-held showerhead. Guest bedroom one has contemporary furnishings, a comfortable king bed and luxurious bedding and offers direct access to the guest bath. Guest bedroom two has a queen Murphy bed and a bunk bed set with full size bed on the bottom and a twin above. This is an ideal room for adults or children. The guest bath has been beautifully updated and has a single lavatory and walk-in shower. The extended back patio is well furnished with a dining table for four, a seating area and two chaise lounges. The gas BBQ grill is located just outside the kitchen door. Enjoy morning coffee in the sun or one of the beautiful desert sunsets while dining al-fresco. Throw open the great room and kitchen sliders and experience perfect indoor/outdoor desert living. To make room for the hallway powder room, the laundry has been move out to the garage. A door added to the master suite gives direct access to the garage and laundry. The owner has a personal car stored in the garage which does not allow room for an additional car. Tenants will be required to park their cars in the driveway. Other amenities include Wi-Fi and free U.S. and Canada long distance calling. Pool and spa are located directly across the driveway ... just steps away ... and on a quiet street close to back gate; a short walk to the weekend College of the Desert Street Fair! This is not a typical vacation rental home. Updated and decorated with quality furnishings and supplies, and all the amenities of home, this home is well loved, squeaky clean and very well maintained. Guests will not want to go home!